Line perforated 11½, buff colored book paper, no gum, no watermark, typeset. Printed by Martynas Kukta in Vilnius. First Vilnius issue, thin figures. Preceded the December 31, 1918 Second Vilnius Issue of thick figures by only 4 days. The stamps were printed in sheets of 20 (5 by 4) and the sheet edges were not perforated. Only six stamps (30%) from the middle of each sheet are possible perforated all around, the 10 (50%) edge copies have one straight edge and the four (20%) corner copies have two straight edges. The stamps were printed in a hurry on the night between the 26th and 27th. The printer usually only printed books and forms, so the only materials for the design were primitive types. 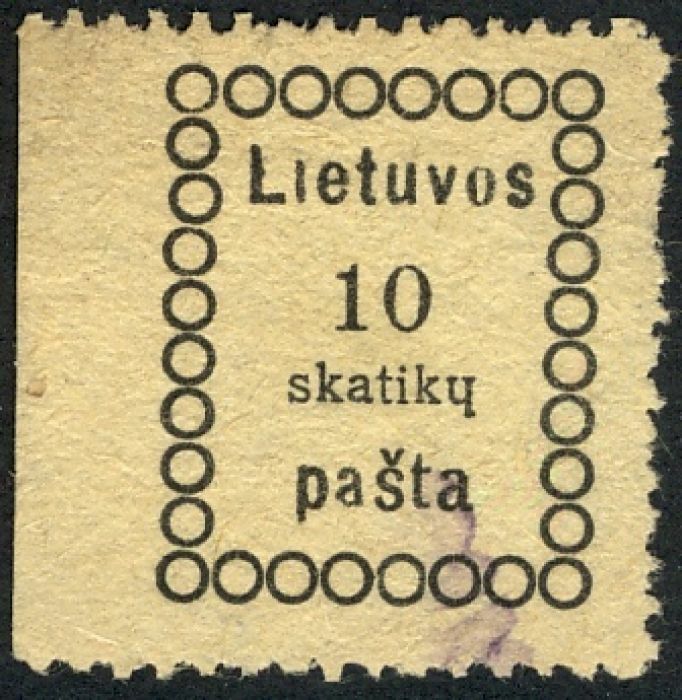 There weren't even enough types for the last lithuanian letter in the word "skatikų". Only seven were available, so 12 inverted "h" and one inverted "ń" were used. Scott previously listed WW1 German occupation stamps (German overprints) under Lithuania, noting that they were used more widely than just Lithuania. Gibbons † lists these under Germany (Pt.10) , Eastern Military Command Area, Russian Baltic Provinces and defines the area covered as the "Postal Territory of the Commander-in-Chief, East (Postgebeit Oberbefehishaber Ost)". Δ FICC Journal v26n1p4 reported that from 2015, Scott has renumbered the Postgebeit Ob. Ost overprints as Russia N1-N12. 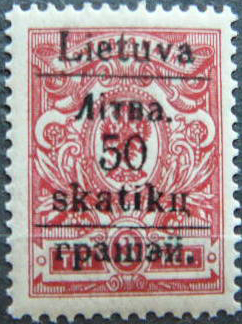 Soviet troops occupied Vilnius in January 1919, established a communist government and issued overprints of Russian stamps. 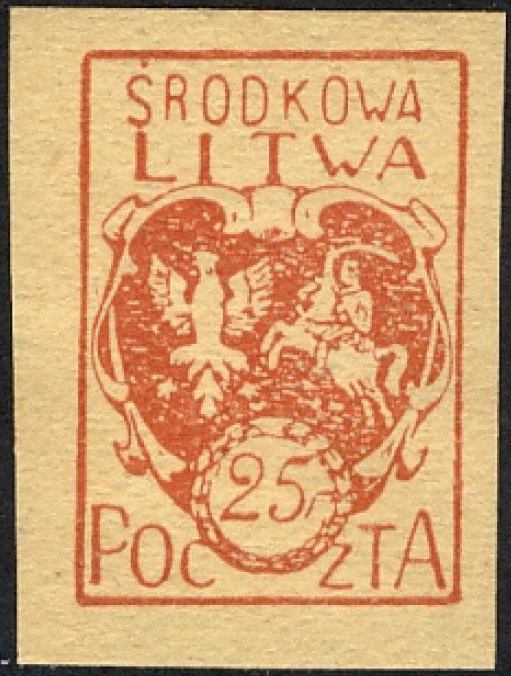 Scott lists this as "South Lithuania, Drodno district" (SG1 is on an imperf Russian 1k stamp, mentioned but not numbered by Scott). Polish troops forced the Red Army out in April. 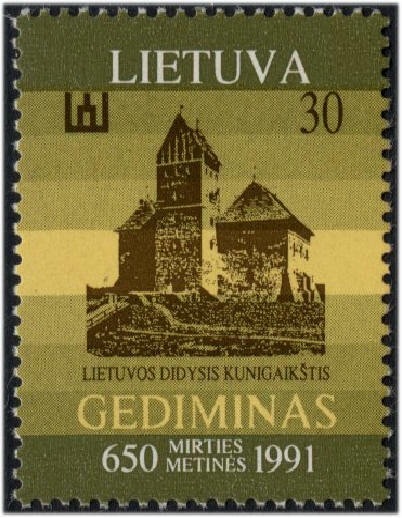 A treaty was signed with Russia in July 1920 acknowledging Lithuanian rights to Vilnius and Grodno. ‡ Central Lithuania is a separate listing in Scott (under C rather than L). Gibbons lists these as Lithuania, Polish Occupation, Central Lithuania and has an additional category of Warwiszki, described as a "neutral zone between Lithuania and Poland occupied by the Poles" in 1923. Under a Lithuania sub heading "Soviet Republic", Gibbons notes that in October 1939 Lithuania allowed Soviet garrisons in return for Vilnuis which Russia had taken from Poland. 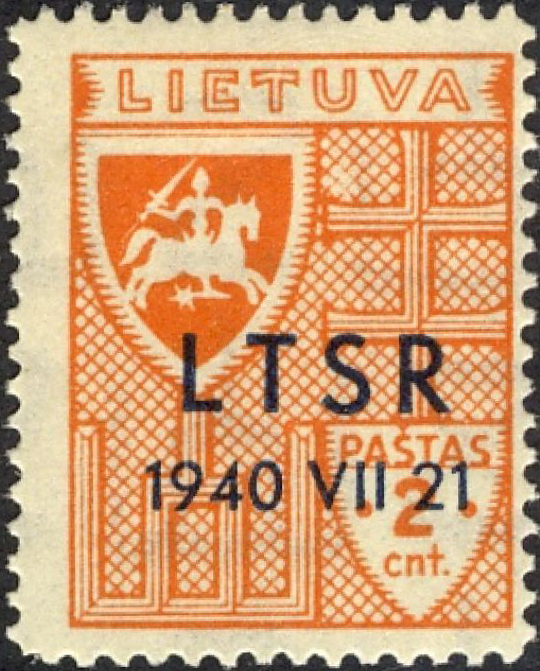 In June 1940, the Red Army seized Lithuania and in July established a new Lithuanian government that in August requested admittance to the Soviet Union. this story is remarkably similar to Latvia's. § For the German occupation of WW2, Gibbons lists Russian overprints of 1941 (not yet found in Scott) and states that these were replaced by "OSTLAND" overprints later that year which both Scott and Gibbons list under Russia. On 11th March 1990 Lithuania declared its independence and this was eventually acknowledged by the USSR on 6th September 1991. Scott initially ignored the first issues, but now notes that Sc371-399 were "issued before the Soviet Union recognised the independence of Lithuania". Sources: ScS, SG7, SGP10, Δ FICC Journal v26n1p4. Images from David Olson, ebay, Delcampe.